Maggie Thatcher's career before politics? Its pretty stupid I know. I would rather have a yellow strip on the side of the troopers leg than have this. "GRANDMA!!! DID YOU SEE MY TROOPER-SUIT??? GRANDMA???!" Just about anything would have been better than what they gave us. The "customisation" section in this game is probably the laziest part of the entire game. You wouldn't see a storm trooper running around on Hoth with no helmet on and why should I have to rank up just to grow a beard. Lol, I hate the storm-troopers with no helmets. You never see them without their helmets in the original trilogy. They should have let you add other things, like symbols or different backpacks or gear. I hope they rethink this but doubt they ever will as a lot of work went into making it I'm sure...but geez what a terrible idea. I ONLY play with the old lady. 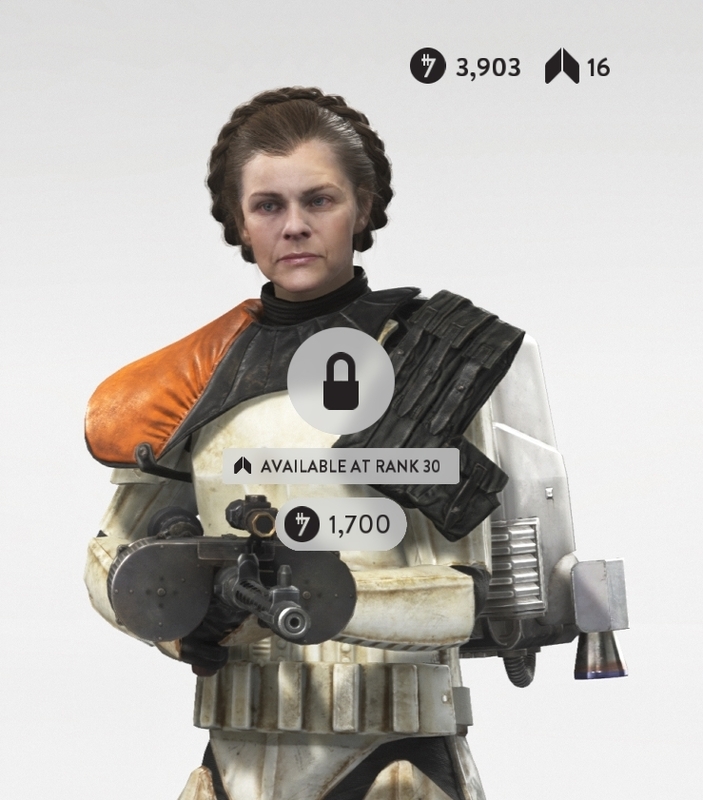 IMO she is way better than any of the other skins because when I wreck fools, they are getting wrecked by an old lady. Personally I think she is the best thing about this game. That is no jump pack, its where she keeps her baked cookies and medication! I'm not certain about that. It's the exact same heads that they gave the rebels, they just stuck a storm trooper body underneath them. And is there a reason this was moved to off topic? I meant this as a critique of the storm trooper customization in the game, which I think is completely awful. So this is game related and not off topic. I used the picture to convey my point. This had me laugh way too hard for some reason. But I do not like the fact the they take off their helmets.